Dublin’s oldest gay nightclub is closing down. A group of old friends gather to see the place off, but before they can do that, some old scores will need to be settled. Are there some things that just can’t be forgiven? Set in 1993 and the present day, The Paradise is a new immersive electro-pop musical, with fiendishly catchy songs by the Irish duo, Eden. Brought to you by the team behind last year’s festival hit, The Ref. Matthew Shepard, a 21 year old gay student was tortured and left to die at a fence in Laramie, Wyoming on October 12th 1998. 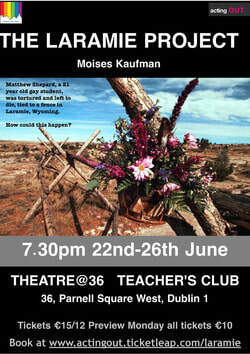 This searing and forensic examination of how this terrible crime could happen, draws on interviews with over sixty people, friends and family of Matthew and residents of the town of Laramie, reflect on a murder which led to an international spotlight being put on hate crimes everywhere. 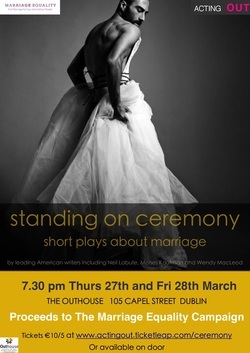 In these nine short plays we meet a Christian Fudamentalist who thinks that the gay couple who have just moved in next door have designs on her husband, a couple who can't agree on their wedding vows, a woman having second thoughts about her impending wedding in another country, and two men whose long planned for wedding ends in unexpected tragedy. You'll, laugh, you'll cry, and you'll understand what all the fuss is about, as we enter the run up to the historic referendum on marriage equality. In this spiky comedy, we meet Susanne and Clive, a couple who seems to have it all; the big house, money and social standing. But Susanne’s sharp (and very politically incorrect) tongue is of little use, when her Polish cleaner Magda, who has secret plans of her own, reveals that Clive is not all he seems. Can they each find happiness out of the carnage that ensues? 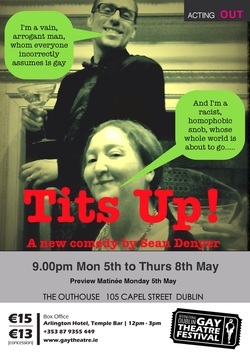 The production recently completed a sell out run at the International Dublin Gay Theatre Festival where Acting Out were nominated for the Doric Wilson Award. 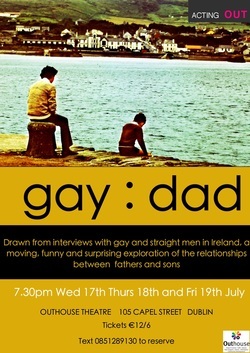 Drawn verbatim from interviews with gay and straight men in Ireland, a moving, funny and surprising exploration of the relationships between gay and straight fathers and and their gay sons. 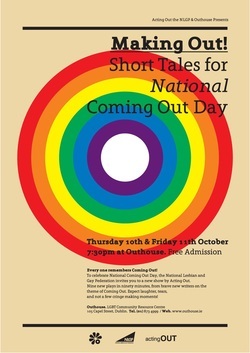 To celebrate International Coming Out Day, on Friday October 11th, the National Lesbian and Gay Federation invites you to a new show by Acting Out. Nine new plays in ninety minutes, from brave new writers on the theme of Coming Out. 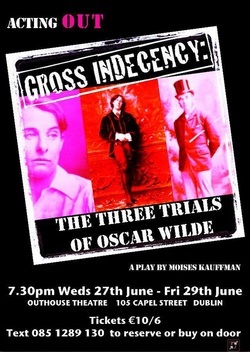 This dramatic interweaving of transcripts from the three trials of Oscar Wilde for Gross Indecency with contemporary accounts, newspaper reports and interviews from friends and enemies collide to produce a powerful examination of homophobia, hypocrisy and the double standards which left Oscar Wilde, the most popular playwright of his time, in ruins.